Recently I noticed a 3/4 Brad Nail in our dog food bowl, not being able to make any sense of where it had come I removed it and disposed of it. Then not to long after I found the same sized Brad Nail on the floor near his food bowl. Again with some concerns I still could not comprehend where this other one had come from. Unknown to me, my wife had discovered the same type of Brad Nail in the dogs food but she had also dismissed the incident until we happened to be speaking about dog food and we both mentioned the finding. Since then upon feeding our dog we have paid more attention when we poured the dog food into the bowl and found that on two other occasion the presence of 3/4 Brad Nail. These Brad Nails go undetected between the grains of the dry dog food and the steel colored bowl, but once we knew what we where looking for they have been easy to spot. On August 15th on my last discovery I became seriously concerned and called our local Petco on 9717 Roosevelt Blvd., Philadelphia, PA 19114-1010 to inform and inquire if anyone else had reported such a case. After explaining to the manager what had transpired who showed an air of indifference, she was able to track down our purchase through the Petco member account. The results showed that on July 21 we had indeed purchased item 001368095 Mer-Dog (Merrick)30# 5s WIL $46.98 Regular price $62.99 along several other items. Our name or phone number was never asked and as of this email we have not heard from the Pecto manager. Since then, with the uncertainty that our dog may have already swallowed some of these Brad Nails, we have disposed of the remaining Merrick dog food and replaced with a 30# XXXX purchased at Pet Smart. We hope and pray that because of his large size and with the possibility that we may have caught what may have been the beginning of the appearance of the Brad Nails because of the consumption of the dog food there is no effect on him. We are not only concerned for the welfare of our pet Cooper but for others that may ingest several unexpected Brad Nails, causing severe health damage or death. The same letter will be forwarded to the Merrick dog food manufactures. Unfortunately, the owner did not specify the type of food that was purchased, but it was most certainly a dry dog food. Merrick makes several different kinds of dry food. 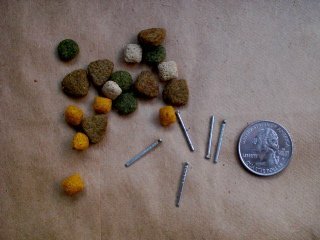 Merrick has since contacted the dog owner saying that there were no other instances of nails found in its pet food that had been reported. Petco did not respond at all to the letter. If you feed your pets Merrick brand food, you might want to take a second look at the bowl, once it's poured.